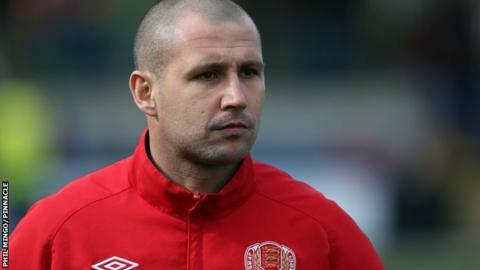 Jersey boss Craig Culkin and assistant Dave Kennedy have resigned after the Muratti following a selection dispute with the island's Football Association. Culkin told the BBC that he is leaving his job after he and the Jersey authorities have disagreed over the inclusion of Michael Weir. The Jersey-born former professional was named as a substitute for the clash with Guernsey. He has played just one game in the island this season. Under inter-insular rules, players who are born in Jersey, such as Weir, are eligible to play in the fixture, even if they have been playing elsewhere. Weir has been on the books of Southampton, as well as playing in Cyprus for Doxa Katokopias and Portuguese side Nacional. "My decision was made in past week," said Culkin. "When you've got a CEO who wants to select your team for you and question personnel it becomes difficult. I'm surprised I've stayed on this far. "People on the executive are working outside their remit and trying to make selection decisions." JFA president Phil Austin told BBC Radio Jersey he had yet to speak to Culkin, but was not surprised by his decision. "There has been some discussion with the executive over the selection of one player who's hardly played in the island over the past four years. "We haven't interfered apart from the case of that one player, as we felt it wasn't fair on other players to parachute this player in," he said. "In the light of this we'd be asking him to stand down anyway, so we can call it a mutual decision. "We've got principles in the way we want to take Jersey football forward and it probably needs a change of leadership as a result."